BEAU LESHEN hands off to Nathan Parks in the winning 4x200 meter relay team. 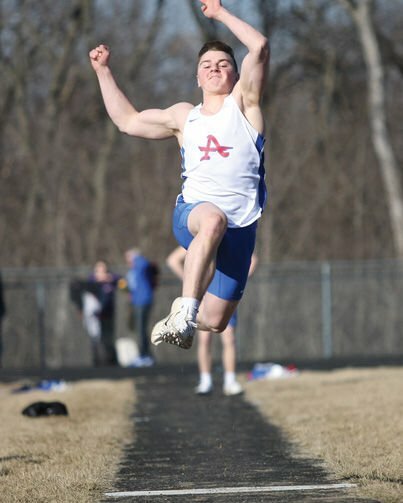 The Albia High School boys’ track team hit the oval at home on Thursday, getting outside for the first time this season. Though there were no team points taken the Blue Demons made it count on the track. “We had a nice night to get out and compete in front of our home crowd,” said Coach Darren Hill. In the field events Gage Wilson placed first in the long jump (20’4”) while Nathan Crall placed second (19’3”). In the high jump Blake Stewart finished second (5’6”) and Blake Chance placed fifth (5’2”). Beau Leshen was third in the shot put (37’11.5”) and Doug Flattery was second in the discus (109’5.5”). Individual races went as follows. In the 3200, Brock Ratliff placed second (11:06.08) and Cody Dalman finished third (12:01.59). In the 100m dash Logan Stalzer placed second (11.25), Beau Leshen was third (11.4) and Crall was fourth (11.55). In the 400m dash C.J. Ratliff won with a time of 59.85 while Zach DeMoss placed third (1:01.79). In the 110m hurdles Drew Winke won the event with a time of 15.69 while Carter Anderson placed third (18.18), Nathen Wilson fifth (18.7), and C.J. Ratliff was sixth (19.03). In the 800m run Brock Ratliff won the event with a time of 2:14.39, Eli Zanoni placed sixth (2:36.05) and David Thomas finished eighth (2:37.72). In the 200m dash Albia took the first three places as Beau Leshen won with a time 23.69, Nick Heffron placed second (24.2), Gage Wilson third (24.36). In the 400m hurdles Carter Anderson placed third (1:06.46), C.J. Ratliff fourth (1:07.88) and Damon Sovern fifth (1:13.09). Albia had three first place finishes in the relays. In the sprint medley the Blue Demons had two teams. Team two (Jackson Pence, DeMoss, Chance, Nathan Parks) placed second in 1:46.72 and team one (Doug Flattery, Jer McAninch, Nathen Wilson, Wade Myers) placed third in 1:49.43. The 4x800 team (Teno, Gavin McMurry, Smith, Joe Myers) placed third in 10:57.13. The shuttle hurdle relay team (Winke, Anderson, C.J. Ratliff, Nathen Wilson) placed second in 1:07.21. The distance medley team (DeMoss, Austin Major, Jalen Cox, Teno) placed third in 4:45.02. The Blue Demons had two 4x200 teams. Team two (Stewart, Parks, Leshen, Sovern) placed first in 1:40.36 and team one (Wade Myers, Pence, Heffron, Chance) placed second in 1:41.21. 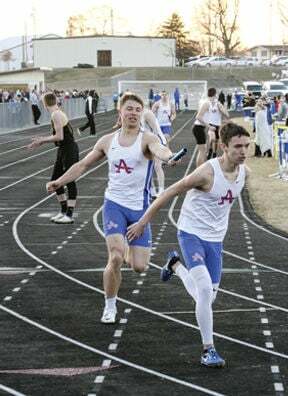 Albia had two 4x100 teams with team one (Winke, Crall, Gage Wilson, Logan Stalzer) placing first in 44.99 and team two (Wade Myers, Flattery, McAninch, Stewart) placing third. The 4x400 also entered two teams. Team one (Winke, Crall, Stalzer, Heffron) placed first in 3:36.92 and team two (Parks, Smith, McAninch, Cox) placed fourth in 4:21.83. The Blue Demons traveled to Oskaloosa on Tuesday. Full results will be in Thursday's U-R.